HELPING WITH A CRAMP – Yukon Quest musher Denis Tremblay carries one of his dogs to the sled Tuesday in Dawson City because they were cramping up. A BIRTHDAY IN THE KLONDIKE – Yukon Quest musher Paige Drobny and her team arrive at the Dawson City check- point on Tuesday – which happened to be her 44th birthday – in fifth spot. Yukon Quest musher Michelle Phillips was the second racer to pull into Dawson late Tuesday morning, less than half an hour behind frontrunner Brent Sass. DAWSON CITY – Yukon Quest musher Michelle Phillips was the second racer to pull into Dawson late Tuesday morning, less than half an hour behind frontrunner Brent Sass. 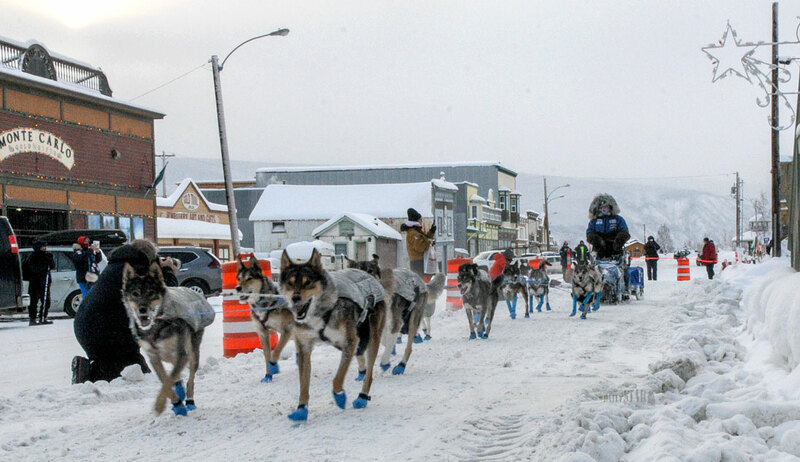 With all 14 of her dogs, Phillips arrived to cheers from the spectators lined along the trail at 11:51 a.m.
“I was happy to see Dawson,” said Phillips, from 10 Mile, Yukon. Phillips left Carmacks with 11 dogs, and from Pelly, glided out with all 14. Nothing stood out from Pelly to Dawson, Phillips said, but it was nice to be back on the trail. “It was really cool to come back and visit the trail. I haven’t been on that trail for so many years,” said Phillips. She hasn’t done the Quest in seven years. Phillips passed defending Quest champion Allen Moore earlier in the day. He said her team is probably looking the strongest. Phillips plans on resting during her mandatory 36-hour break in the Klondike capital. “I’m going to take care of my dogs, get something to eat and get some sleep,” she said. Being second into Dawson was a pleasant surprise for her. “No, not really, I didn’t (expect it); it was a nice surprise,” said Phillips, when asked what it meant to be the second musher in. 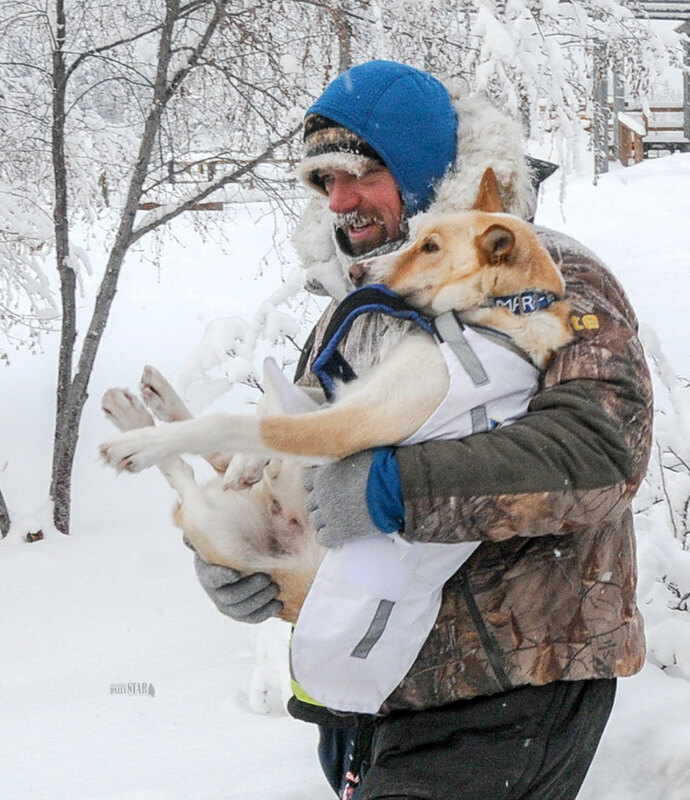 Fellow Canuck Hans Gatt reached Dawson at 12:07 p.m. Tuesday with a team of 13 dogs. Gatt did not speak long after arriving at the checkpoint, but agreed that not much stood out between Pelly and Dawson. Moore was hot on Gatt’s heels, getting into Dawson at 12:16 p.m.
Moore began the race last Saturday with 13 dogs, adding his last dog in Pelly. He said his team is doing well, but they weren’t as peppy as he would like to see them. Moore said the top of King Solomon’s Dome has been the highlight of his race so far. The top five mushers are tightly packed together. Because of the format of this year’s race, Moore said, it was to be expected. “We’re close?” Moore asked jokingly. “The way the format was set up, there is a lot of people that are going to be close, not just the top four. “It will be interesting to see what the strategy will be from here on. We’ve all been here before. It’s just a question of who can keep their dogs together, not get too many injuries,” Moore added. With the top mushers’ close proximity, Moore is enjoying the different vibe of the race. Before Moore left for Dawson from Pelly, he had said he was looking forward to some lasagna waiting for him at Stepping Stone. “It was great, wonderful,” Moore said of his anticipated feast. Paige Drobny rounded out the top five, getting into Dawson City at 2:06 p.m. Tuesday. As she approached the checkpoint, a chorus of Happy Birthday rang through the air, honouring her 44th. “I’m going to celebrate my birthday for the first time in seven years,” Drobny said when asked about what she’ll do in Dawson for her 36-hour break. When Drobny stopped, her dogs could be heard still barking and still pulling at the sled, looking like they could continue running. “They are (still ready to run),” said Drobny. She was asked at the checkpoint if she thought she was one of the frontrunners. Once she and her team had left the checkpoint, the spectators went back inside to escape the cold as snow began to fall over the town. Denis Tremblay was the third Canadian to arrive, coming sixth down the chute Tuesday afternoon with 13 dogs. “Tough,” Tremblay said of the stretch from Pelly to Dawson . “Lots of mountains. It’s very tough for the dogs. Matt Hall followed Tremblay in at 5:43 p.m. Tuesday, while Ryne Olsen reached the checkpoint at 6:39 p.m. Asked if she’s gaining some ground in the standings, Olsen was quick to say there’s still a lot of trail left. Torsten Kohnert arrived in Dawson with Nathanial Hamlyn hot on his heels, reaching the checkpoint three minutes after Kohnert. Hamlyn, last year’s Red Lantern recipient for finishing last, said the trail is satisfactory. “The trail was really good,” said Hamlyn as his dogs howled. Hamlyn planned to use his time in Dawson to sleep and come up with a game plan. Martin Apayauq Reitan was the last musher to reach Dawson, coming in shortly before midnight Tuesday. There are some big hills for the mushers to climb to reach Dawson, but he described them as fun, adding his team did really well. During his layover, Reitan said he will be adding whale blubber to his team’s menu – a fatty item from his hometown of Kaktovik, Alaska. Lisbet Norris, the current potential Red Lantern winner, was 27 miles outside of Scroggie as of mid-morning today.